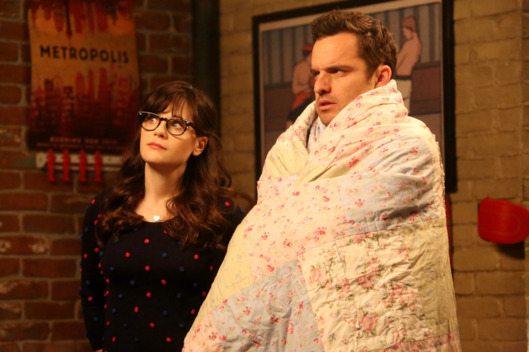 When New Girl's season two aired, I feared that it would hit what is known in television as the "sophomore slump." That slump is the reason I stopped watching The Flash and Jane the Virgin this season — both shows were excellent in their first seasons. More than that, really: they were prime examples of how great television writing could be in terms of drama and comedy. And they were beacons of hope for The CW, a network looking to bolster its credibility among the other, more prominent networks. But then, the shows — in my opinion — began a gradual slide downhill. I've stopped watching them and I feel like I've missed nothing, really. The challenge with television is that first seasons are often so jam-packed and captivating because the writers want their audiences engaged; they want them to really care. So they pull out all the stops — dramatic winter finales, hook-ups and break-ups, and cliffhanger endings. And then, when season two hits, the shows are generally unable to continue the momentum that powered them through their first years. But not New Girl. Arguably, New Girl's second season is the direct opposite of a "sophomore slump" (they saved that a little bit for their third season, which I still argue is not as terrible as everyone claims it to be). The second season's stellar writing, excellent directing, and top-notch storytelling are to be credited for its success. But one other element captured our attentions: the relationship between Nick and Jess. The second season was a gradual build-up to the romantic tension that had been there since the pilot. And when "Cooler" ended with a sizzling first kiss, the show's already-great season was catapulted into "phenomenal" status. Everything post-"Cooler" is quality (just look at the grades that The AV Club writer Erik Adams gave every episode after that point). The show found its groove with those two, and it found its heart and comedy as well. Flash-forward to season five, which is maintaining the same level of consistent hilarity that the second season did. And "Sam, Again" is — I believe — the first step in New Girl completing that parallelism, especially in regards to the Nick/Jess relationship. This episode focused on the return of everyone's favorite child's doctor, Sam. We remember Sam, right? The tall, ruggedly handsome man Jess was dating when Nick planted that life-changing kiss on her. Well, Sam returns but not in the way we left him. He's got a beard, long hair, has become somewhat of a hippie... oh, and did I mention that he's dating the principal of Jess' new school? The school is a Montessori one — a perfect fit for Jess, who carries around things like "talking sticks" and makes people tea to get them to open up. The principal, Genevieve (played excellently by the wonderful Lucy Punch) is hesitant to fully accept Jess into the school once she finds out about the history she has with Sam. And then, one of Jess' best — and worst — qualities resurfaces: her inability to let things go. One of the most admirable aspects of Jess' character is that she's an eternal optimist. She never sees obstacles as insurmountable. No person is too far gone to become a friend (recall how Jess desperately wanted Schmidt's mom to like her? ), and nothing — no conversation or problem — can ever really be dropped. So when the rest of the loft roommates tell her to not pursue Genevieve's approval, Jess... well, does the exact opposite. She shows up at the woman's house, where Sam is there half-naked, and proceeds to let Sam work through his relationship issues with her. And when Genevieve and Jess learn that Sam still holds bitterness toward Nick for what he did, the wide-eyed titular new girl jumps at the chance to fix her problem: she'll just get Nick to apologize. I love and admire Jessica Day for how resilient she is. She is the person who fixes problems, who hates conflict, and who will do anything she possibly can to prevent people from disliking her. She's a bit of a Pam Beesly in that regard ("I hate the idea that someone out there hates me. I even hate that Al-Qaeda hates me"). But the best part about Jess is that her strengths are always her weaknesses. I would argue that most great characters find this to be true of themselves. It is Jess' unwillingness to let Sam's anger toward her go that causes her to pursue a conversation and ultimately a confrontation. Jess wants the job at this new school so badly that she drags a fever-ridden Nick into the fray. And what happens after that is really interesting. Nick begins to apologize to Sam for kissing Jess in "Cooler." But then... he doesn't. What I love about New Girl as a show is that it never forgets where it came from. It's not always excessive in the way that it incorporates callbacks and Easter eggs, but it's always intentional. And the fact that the show is making an effort to re-integrate Sam into the loft dynamic again makes it pretty clear that the show is setting this season up to be a parallel track to season two. The question is: knowing how that season ended and the Nick/Jess dynamic that evolved, how might season five parallel this? And with another Cece wedding set to end this season, just as it did in season two, what could this mean for the two roommates? My hope is that by bringing Sam back, Nick and Jess might parallel their romance from the second season — this time for good. What New Girl has subtly done over the past few years is carefully re-construct the Nick/Jess dynamic. Nick has become more confident and successful. He's learned how to embrace his weirdness and confront things and feelings. Look at what happened with Reagan: after years of forcing himself to panic moonwalk away from awkwardness, Nick openly admitted his feelings. That's a step forward from the same sidewalk-stoop conversation Nick and Jess had in "First Date" (a parallel I just now realized, and is kind of brilliant). And Jess needed to be in a serious relationship in order to realize how much Nick cares and will always care about her. I think she took him for granted a lot, and seeing his response in "Oregon" to her heartbreak was an indicator that he'll always be that guy for her, no matter what. Nick and Jess had such a solid friendship and that's the thing this series was built on, in regards to their relationship. Their chemistry — however powerful — is always secondary to their genuine love for one another as people. So, when given the chance to re-live season two (because spoiler alert: from episode descriptions, it seems that Jess and Sam will get back together at some point this season), will Jess choose differently this time? Or will Sam always come in second place when it comes to Nick? During this episode, I was sick. So literally art was imitating life as I curled up on my bed to watch "Sam, Again," blowing my nose into a pile of tissues just like Cece. Yay! Also, how fun was it to see a sick Nick and Cece banter? I could watch them watch Poppycock Palace all day. "We met a lot. Sometimes in the day... and sometimes in the... nighttime." I didn't talk about it above, but the other plot of this episode involved Winston freaking out over his first date with another girl since admitting his feelings for Aly. Schmidt, naturally, freaked him out so he pretended to be sick in order to avoid the date. Eventually though, Winston went on the date. Schmidt's presentation is called "I Hope You're Sitting Down for This" and I cackled. Also, I love the return of Schmidt's boss and co-workers. Schmidt's inability to pronounce the word "fury" ranks among one of the comedic bits Max Greenfield can totally sell (along with his pronunciation of "buttons"). "All these puppets do is sing about how they're friends. I'm starting to not believe them." How much would I have to pay Liz Meriwether in order to get an entire episode featuring Poppycock Palace? Hannah Simone's physical comedy bit of blowing her nose disgustingly was GREAT. "You haven't met Nick. He's the most throat-punchable boy in the world." "Sam, 'bro' is a beach term." I love that Sam punched Nick in the throat AGAIN, and Jess had the exact same reaction. "I'm not sorry that I kissed your girlfriend. ... We fell in love with each other. Like, crazy love." Guys, I just love Nick and Jess so much. "LOOK AT THESE RIDICULOUS SHOES!" I've missed you, David Walton. Further proof that Jess cannot let things go, even when people tell her to: she returns to Sam's house at the end of the episode with a tray of apology brownies after she accidentally causes his break-up with Genevieve. Sam is not amused. What did you all think of "Sam, Again"? Are you excited for the return of his character? Hit up the comments below!